This entry was posted on November 12, 2018 by Zoe Thomas. Sit-stand desk use can make us feel happier and sharpen work-related traits like decision-making and problem-solving, according to brain scientists at University College London. People use sit-stand desks for many different reasons - some to combat back pain symptoms, others to prevent sitting-related health problems. But do sit-stand desks also have a baring on us psychologically? Can the simple act of moving between sitting to standing throughout the day impact our cognitive functions and change the way we work? To find out, we teamed up with Vincent Walsh, Professor of Human Brain Research at University College London (UCL). He devised a series of behavioural experiments for a group of 15 typically sedentary office workers. The workers were asked to carry out the tasks twice: once at the start of the five-day trial, and again at the end. During the five days, the workers were asked to use our new portable Opløft sit-stand platforms instead of their usual static desks. The office workers achieved significantly better results in the majority of tasks after a week of using Opløft. While previous studies have highlighted the physical health benefits of increased activity - such as reduced risk of musculoskeletal disorders, obesity and cardiovascular diseases - this is the first study of its kind to look at how productivity and emotional wellbeing may be enhanced with access to sit-stand desks at work. Task: a visual search test inviting participants to find the odd one out. Participants performed the task 10% faster and 45% more accurately after five days of Opløft use. Task: a version of the BART (balloon analogue risk test). With Opløft use, the participants’ judgement was deemed twice as reliable, making them half as likely to make a critical mistake. They also behaved less impulsively. Task: A problem-solving anagram challenge. Participants demonstrated better language-based problem-solving skills with the use of sit-stand desks, showing a 64% improvement from the beginning of the trial. Task: An emotional stroop test. Unhappier people typically have a slower response to negatively emotional words when taking this test; however, Opløft users demonstrated a quicker reaction to negative words, suggesting a state of happiness. Task: A RAT (remote associate) test involving word association. Participants scored 28% higher in this creative thinking test while using Opløft, compared to when they were using static workstations. “The research was fairly conclusive in proving that having access to Opløft made people more productive. However, the greatest excitement was the results of the test for attention and concentration levels. Not only did our trialists perform much faster after using Opløft, but there was also a strong increase in their accuracy. People usually trade off accuracy when speed is increased, but Opløft users were able to improve both, which is impressive, and something I have never witnessed before. What does this mean for office workers? Currently it’s estimated that only 1% of UK workers use sit-stand desks, compared to 90% of Scandinavians. With mounting evidence supporting the physical and psychological benefits of moving more at work, it is possible that static workstations will soon become a thing of the past. Having the freedom to move at work is in growing demand in the UK. 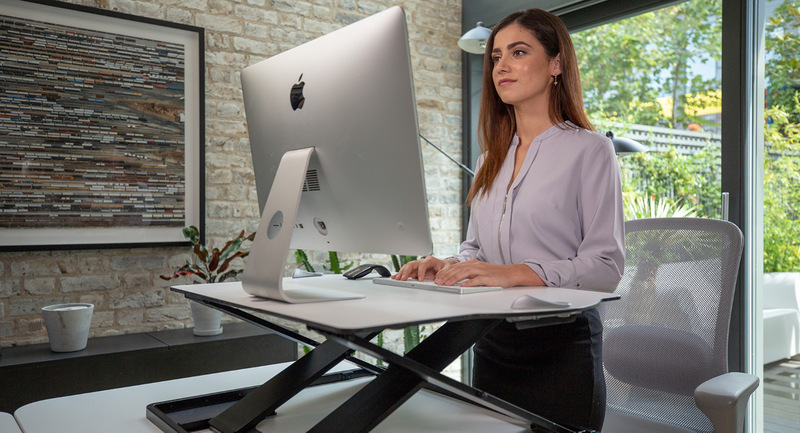 According to a new poll as many as 79% of us would choose to use a sit-stand desk at work given the choice and 68% of us believe employers should be required to offer employees a sit-stand desk. Over half of those surveyed believe that having the use of a sit-stand desk like Opløft at work is as important a staff benefit as a company car and gym membership. Over one in five of us (21%) would consider turning down a new job if the prospective employer didn’t provide the flexibility of a sit-stand desk. Posturite’s CEO Ian Fletcher-Price views Opløft as a revelation in sit-stand desk design. Not only does it give users the ability to stand to work, but it is also slim and light enough to be easily transported between environments. Opløft is a collaboration between Posturite’s founder and a young designer from Denmark. It began as a concept on Kickstarter and now, two years on, it’s a reality. The secret of Opløft’s strength lies in the unique cross-structure frame, which not only gives the platform a minimalist, classically Scandinavian aesthetic when extended to standing height, but also enables it to fold neatly into its own footprint for convenience. When flat, Opløft is only 30 mm thick and weighs just 12 kg - making it possible to carry between workstations or neatly store away. You can pre-order Opløft now.